The South Bowyer UCBC Mooring Buoy has been damaged repeatedly from improper use by a large vessel. Twisting the bumper ring making the buoy difficult and possibly unsafe to use. Damage to the North Bowyer UCBC Mooring Buoy. Some mooring buoy users are securing to the bumper ring of the buoy rather than the centre mooring ring. Both damaged Bowyer Mooring Buoys will now have to be removed and replaced with a new buoy while the damage is repaired on shore. The cost of a replacement Mooring Buoy and the time required to perform the work are an unnecessary burden both on the UCBC and its volunteer divers. 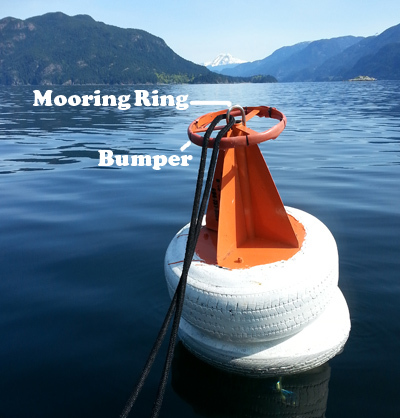 The lifespan of a Mooring Buoy, when used properly, would be around 15 years. Please take care when using these free public mooring buoys so they can be enjoyed by everyone long into the future.